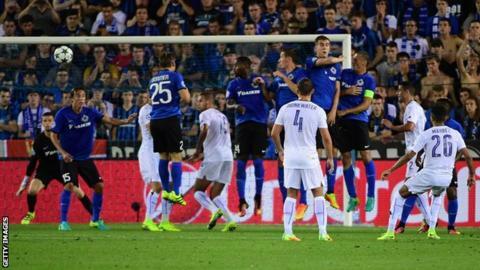 Leicester City celebrated the first Champions League match in their history by cruising to victory against Club Brugge in Belgium. Marc Albrighton scored with the Foxes' first shot after a defensive error from right-back Luis Hernandez's long throw. Riyad Mahrez curled in a masterful free-kick for 2-0 before half-time. Mahrez smashed in a penalty after Jamie Vardy was brought down by the keeper, before Brugge's Jose Izquierdo hit the post, adding to his bad miss at 0-0. There will be more difficult games than this, but the Premier League champions displayed a maturity and composure that suggests potential to achieve more success at the elite level of European club football. This was only Leicester's ninth European match, and their first win since a victory over Glenavon of Northern Ireland in the preliminary round of the 1961-62 Cup Winners' Cup, when Gordon Banks - who won the World Cup with England in 1966 - was in goal. Leicester could have won by more on Wednesday. Danny Drinkwater went close with a dipping volley struck on the turn with the ball almost at ground level from outside the box, while Robert Huth might have added a fourth from another of Hernandez's several long throws. Debutant and club record signing Islam Slimani should have made more of a terrible Benoit Poulain back pass, and was booked for shoving Bjorn Engels in the back, with the Belgium defender forced off with what looked like a dislocated shoulder. In the other match in Group G, Portuguese club FC Porto drew 1-1 at home to FC Copenhagen of Denmark. "It's impossible to win the Champions League," Leicester manager Claudio Ranieri said on Tuesday. "There are so many big teams. To win it we have to write another fairytale." Eight years ago this September, Leicester supporters might have been looking forward to a decent run in the Johnstone's Paint Trophy after beating Hartlepool in the first round (they eventually lost to Rotherham in the Northern Section quarter-finals). Now they are in with a good chance of making the Champions League knockout stages, but even if the Foxes do not make it out of the group, the fact they have made it to Europe's elite competition - and as champions of England - remains remarkable. The hundreds of fans revelling under the historic gabled roofs of Brugge's sun-drenched squares may not have been able to explain how this moment had arrived, but there was plenty of infectious optimism. That same feeling was nurtured by Ranieri as he willed them to "keep dreaming" after last season's shock Premier League title win. The away allocation was only 1,400 and although many others travelled despite not having tickets, they had been told they would be refused entry if they tried to buy tickets for the home section. Albrighton's opener was the perfect start to what promises to be an intriguing campaign, but more than one slice of luck went Leicester's way in the early stages. Moments before Albrighton profited from a mix-up between keeper Ludovic Butelle and midfielder Hans Vanaken, Brugge should have gone ahead themselves. Wes Morgan was totally caught out by the pace of Izquierdo running on to a Vanaken through ball but the Colombian striker was wasteful, shooting wide with Kasper Schmeichel exposed. The lead gave Leicester licence to adopt the formula that brought them so much success last season - sitting back and playing on the counter-attack. Former Belgium goalkeeper Michel Preud'homme led Brugge to their first league title in 11 years last season. But one win from their past five matches means they are 10th in the Belgian table and they never really threatened to break Leicester down once they had gone behind. Leicester manager Claudio Ranieri, speaking to BT Sport: "I said to the players when you hear the Champions League music it charges the battery and makes you fight. "It was an important win for us after the Liverpool defeat. We scored very early and that gave us more confidence during all the match. "Club Brugge moved the ball very well, they had the control of the ball but we had control of the match and that was good for us. Maybe at the beginning we surprised them." Leicester striker Jamie Vardy: "It's the perfect start. We showed exactly what we can do. No fear, we just played our football and let that do the talking." Leicester City became only the third English side to win their first Champions League game (Manchester United in 1994 and Newcastle in 1997). Marc Albrighton became the first Leicester player to score in European competition since Muzzy Izzet against Red Star Belgrade in September 2000. Albrighton created four goalscoring opportunities for his team-mates - twice as many as any other Leicester player. No Belgian club has beaten an English side in the Champions League since Anderlecht defeated Man Utd 2-1 in October 2000 (D2 L11 since). Only AC Milan in November 1992 and Atletico Madrid in 1996 have recorded a wider margin of victory in their first Champions League game (both 4-0). Leicester are back in Premier League action on Saturday when they host Burnley in a 15:00 BST kick-off. They next play in the Champions League on Tuesday, 27 September, with FC Porto the visitors. Match ends, Club Brugge 0, Leicester City 3. Second Half ends, Club Brugge 0, Leicester City 3. Ruud Vormer (Club Brugge) is shown the yellow card for a bad foul. Foul by Ruud Vormer (Club Brugge). Luis Hernández (Leicester City) wins a free kick on the right wing. Leonardo Ulloa (Leicester City) is shown the yellow card for a bad foul. Ludovic Butelle (Club Brugge) wins a free kick in the defensive half. Attempt saved. Leonardo Ulloa (Leicester City) right footed shot from the right side of the box is saved in the bottom right corner. Assisted by Marc Albrighton with a through ball. Attempt blocked. Jelle Vossen (Club Brugge) right footed shot from outside the box is blocked. Attempt blocked. Ruud Vormer (Club Brugge) right footed shot from outside the box is blocked. Offside, Leicester City. Demarai Gray tries a through ball, but Ahmed Musa is caught offside. Foul by Ricardo van Rhijn (Club Brugge). Daniel Amartey (Leicester City) wins a free kick in the defensive half. Hans Vanaken (Club Brugge) wins a free kick in the defensive half. Attempt missed. Demarai Gray (Leicester City) right footed shot from the right side of the box is close, but misses to the right. Assisted by Christian Fuchs following a fast break. Corner, Club Brugge. Conceded by Marc Albrighton. Attempt missed. Robert Huth (Leicester City) header from the centre of the box is close, but misses to the left. Assisted by Marc Albrighton with a cross following a corner. Corner, Leicester City. Conceded by Ricardo van Rhijn. Corner, Club Brugge. Conceded by Robert Huth. Substitution, Club Brugge. Felipe Gedoz replaces José Heriberto Izquierdo. Attempt missed. Ruud Vormer (Club Brugge) right footed shot from outside the box is high and wide to the right. Assisted by Stefano Denswil. Attempt blocked. Leonardo Ulloa (Leicester City) right footed shot from very close range is blocked. Assisted by Marc Albrighton. Delay in match Ahmed Musa (Leicester City) because of an injury. Attempt missed. Benoit Poulain (Club Brugge) header from the centre of the box is high and wide to the right. Assisted by Laurens De Bock with a cross following a corner. Attempt blocked. Ricardo van Rhijn (Club Brugge) left footed shot from outside the box is blocked. Assisted by Stefano Denswil. Attempt saved. Robert Huth (Leicester City) header from the centre of the box is saved in the bottom left corner. Assisted by Luis Hernández. Substitution, Leicester City. Ahmed Musa replaces Jamie Vardy. Tomás Pina (Club Brugge) wins a free kick in the defensive half. Attempt saved. Stefano Denswil (Club Brugge) left footed shot from outside the box is saved in the bottom left corner. Assisted by Hans Vanaken. Stefano Denswil (Club Brugge) wins a free kick in the defensive half. Foul by Laurens De Bock (Club Brugge). José Heriberto Izquierdo (Club Brugge) hits the right post with a right footed shot from the centre of the box. Assisted by Laurens De Bock.